The squares of Savannah serve as parks and public gathering places. They anchor the neighborhoods (locally known as "wards") that surround them. They are part of an exemplary early urban plan, and they act as windows into the history of the oldest city in Georgia - a city founded decades before there was a United States of America. When they were created, the squares offered unprecedented access to green space for all of Savannah's early residents. The 120 British settlers who founded Savannah almost 300 years ago wanted to build an egalitarian society, unlike the monarchy they left behind. Under the direction of General James Oglethorpe, a well-conceived city grid and an idealistic civic vision took shape, with the squares as the central organizing concept. In the Oglethorpe Plan, as it came to be known, public green space, which had been the exclusive purview of royalty and aristocrats in Europe, became accessible to every citizen. The original squares were each surrounded by “wards” of eight blocks – four residential and four dedicated to civic functions. Oglethorpe built four such squares in 1733 and two more by 1736. The plan allowed for future expansion as the city grew; today, 22 squares are preserved of the 24 that rose along with Savannah. A progressive and idealistic society also played a role in shaping Savannah and its squares. When the founders of Savannah first arrived in 1732, slavery was outlawed in Georgia, and relationships with local indigenous people were largely friendly. A chief from the local Creek tribe worked with Oglethorpe on Savannah's founding and was buried with military honors in one of the first squares. The squares went on to survive through difficult and less idealistic times. Slavery was reinstated as a legal practice in Georgia in 1750. 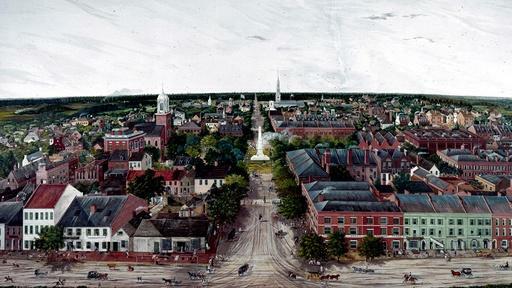 The Revolutionary War saw Savannah occupied by British forces for several years, and the Civil War took a major toll when Union soldiers, led by William Tecumseh Sherman, marched from Atlanta to the sea-capping their accomplishment by capturing Savannah and presenting it to Abraham Lincoln as a Christmas gift. Savannah rose again, and today its squares - many of them wooded with beautiful mature oak trees - serve as an outdoor museum of Savannah's history. They anchor an urban grid that is considered by many to be the epitome of city planning. Learn about Sherman's march into Savannah during the Civil War. Learn why Savannah's squares are considered a model of public space design. Browse other great squares in North America. Plan a visit to Savannah and tour the squares. 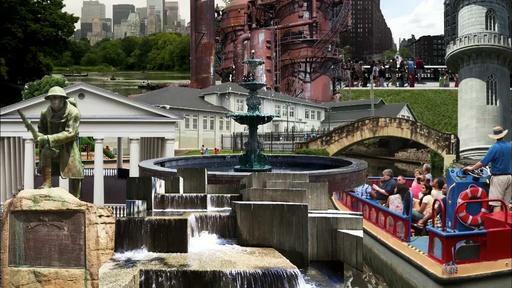 Take a virtual tour of restored Ellis Square. The squares of Savannah were part of an innovative urban plan that took shape in the 1730s.